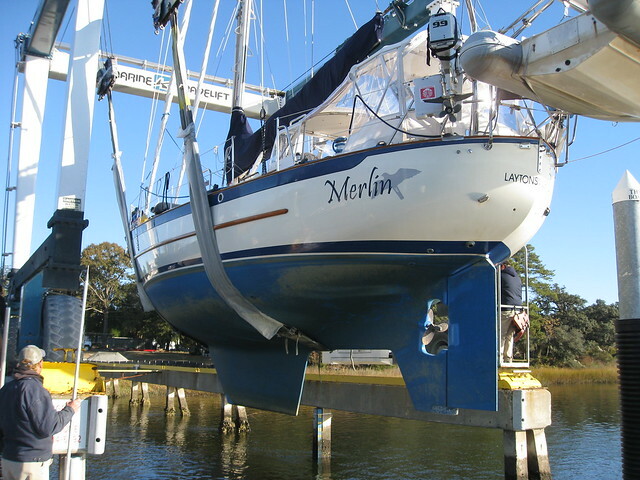 Merlin went back in the water today with a new cutlass bearing and dripless shaft seal. The excitement came about when the boat was lowered into the water and Ed went on board to make sure there were no leaks, but this time there was. When the boat was pulled from the water the lifting sling was on one of the external transducers and although the sling was moved quickly it seems to have broken the seal and water leaked in. So the boat was lifted back out, the transducer removed and rebedded and the boat put back in. As you can see, putting a 30,000 lb boat into the water is not a trivial thing. That seemed to have solved the problem…..for a while. Anyway the sealant leaked and water started flowing back into the boat. Fortunately we were able to tighten the transducer and the sealant held. Now the sealant has pretty much cured and still no leaks, Phew! The new cutlass bearing and seal have quieted down the engine noise significantly so we are happy. We are now about half way between Charleston and Beaufort anchored in a creek off the Edisto River and should be to Beaufort, SC by around noon tomorrow.